A hyena takes a bite out of my camera! Don’t worry! It still works! But ja… Steven brought my Trailcam back from the bush with hyena slobber all over it, a tooth mark on the top and a crack in the plastic that covers the lights. I am not sure if that is going to affect the camera’s waterproof-ness. I will put a bit of tape over it to prevent water damage! 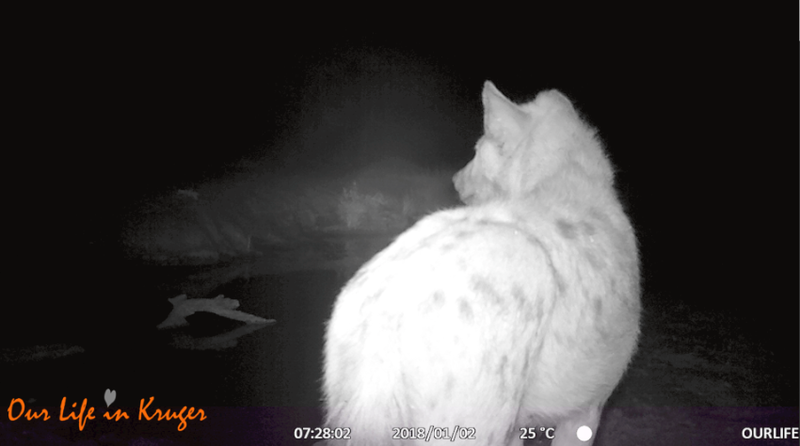 But the hyena trying to take a bite out of my camera has produced some humorous and unique Trailcam footage! You can hear it grunting and groaning as it is trying to get his jaws around my poor camera. Very funny mister hyena, now leave my camera in one piece, please! After the monkeys played with and in front of the gate a bit, they all left to forage. They returned only minutes later, running for their lives! Some of them climbed on top of our fence; others made their way inside and fled up a few tall trees. I could hear a squirrel alarm calling in the distance. My immediate thought was that a hyena probably spooked the monkeys and they came running back to our garden as a safe – and hyena proof – part of their world. I was absolutely right! A few seconds later a hyena appeared. And the Trailcam caught him as well. He is quite far, but see if you can ‘spot’ him. Pun intended!! I hope you enjoy the new Tales of the Trailcam video I loaded on my YouTube channel! My First Time in Kruger – and one Safari Essential to never Forget. It has come to our attention that you have some concerns regarding our interest in your big shiny hard thing sitting outside the gate. In the interests of good relations we should like to point out the following; first, this is an invader; it hasn’t lived here, as we have done, for ever and we need to check it out. To start with, we gave it a wide berth, but since it didn’t respond we have been moving closer and closer to get some idea of its presence here. Second it has a rather interesting, ripe and sticky smell. Maybe its edible in some way. I must say, licking it gave no pleasure. Eeeuuuw. But we’ll keep testing if it keeps giving out these tantlising odours. Maybe if you put something on that we don’t like, we’ll leave it alone. However, if you really want to please us, could you cover it in that chocolate stuff we had once before? Now that we really enjoyed . . . . Thank you so much for your kind letter. Let me explain a vit about that shiney thing on the gate. It is a box that takes videos in the night. I use it to check if there are any dangerous aninals around. So when you are sleeping high up in the trees, there is an extra eye out for your safety. It is not going to taste any better. And you are welcome to check out the images I captured, but please don’t break it ok! It is a good thing to have around! Leuk he? Mijn camera was favoriet bij de dieren deze week! Haha. Blij dat je ervan geniet! I was watching the monkeys play and hoping the camera picked it up. So glad it did it is such cute footage! !